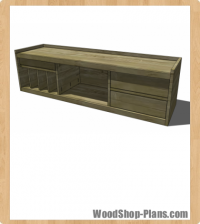 Working from the materials list, begin by edge-gluing enough wood to make all the large panels you’ll need, including the top, bottom, inside gables and shelves. If you have wide boards on hand, save time by making these parts from one piece. Otherwise, laminate the panels and let them dry overnight before surface preparation and cutting. Many of the newer thickness planers can accommodate even the widest of the parts required (e.g., the top), so wait until after glue-up to do your planing. Ensure you remove all glue squeeze-out from the wood before you mill it. When it comes to making the columns, you have two options. You could glue up standard 3/4″-thick pine for these parts or mill thicker wood down to size. For the amount of wood you need for this project, consider using construction-grade lumber. A 2×6 is really 1 1/2″ thick (just right for the 1 1/4″ finished size you need), and with careful selection you can find some nice wood. Choose kiln-dried material and you’ll be able to use it with minimal drying time. Begin by cutting the top and bottom to finished dimensions. First, joint one edge true, then rip the wood to final width. Finish up by cutting the ends square. Take your time: clean, crisp surfaces are essential to an attractive project. The all-important bevels come next, and you have a couple of options for preparing them. The first is to tilt your tablesaw blade to 45º, then cut the bevels required along the longest sides of the top and bottom pieces. Bevel widths differ for the top and bottom, as shown in the plans. Repeat the same operation on the ends of these parts, using either a tablesaw or sliding compound mitre saw. Both the top and bottom members are too large to handle accurately on a typical tablesaw’s mitre gauge, so use something more substantial. Many workshoppers build a wooden cross-cutting sled for themselves, and this can do a terrific job. You can also cut bevels with your router. A large and sharp bearing-equipped 45º chamfer bit does a good job on most wood species. Begin by routing one of the short ends first, taking a series of passes when creating the larger top bevel. Work your way around to the adjacent long edge, followed by the second short end. This order of events automatically removes any splintering that would occur as you round that first corner with your router, helping to create the crisp bevels that make the project look good. Next come the four columns, which you can create from either thick stock or glued-up laminations. Mill them to final size, then sand them with up to 150-grit abrasive. Instead of bevels on these parts, ease each corner of the columns with sandpaper wrapped around a wood block. Your micro-bevel should be just 1/16″. Now cut the inner gables and shelves to the finished width and length. For best accuracy while preparing the corner cutouts in the shelves, place one of your columns on top, flush with the outside end and side of the gables, then trace the column and cut on the waste sides of the lines. It’s time to make some sawdust. Most planed lumber comes from the mill smooth, so unless your wood is really rough you can start your sanding campaign with a 120-grit abrasive, moving up to 150-grit. Regardless of your starting point, a random-orbit sander is best for this work. If you’re planning to stain your dish rack, apply only light pressure on the sander. Random-orbit sanders don’t create a lot of cross-grain scratches, but they’re not perfect. Wood that looks and feels smooth when bare will show unsightly swirl marks after staining if you apply too much sanding pressure. A light hand gives the best results. Just to be safe, use only a handheld sanding block to smooth the bevels themselves. It’s too easy to ruin the bevels with a power sander. Next, cut out the parts for the rack assembly. I used cherry for the top and bottom strips, but oak or maple are good choices too. Pine is too soft for this application, so avoid it. Cut the rack dowels to finished dimensions, then lay out the bottom and top strips. When drilling the dowel holes in the strips, keep an eye on the alignment of the rack dowels: errors will really stand out, so accuracy here is crucial. Make sure you get it right by using a drillpress to bore the holes. If you only have a hand-held drill to work with, take the time to build a drilling jig. 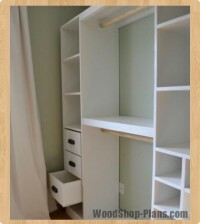 Some 1/2″- or 3/4″-thick cabinet-grade plywood does a terrific job. Carefully lay out hole locations, then drill through the jig. The centres of the holes should be 3/8″ from the back edge of both strips and almost through the thickness of the wood. Cut, sand and insert one dowel between the dish rack bottom and top strips. The overall height of this assembly should be 12 7/8″, or 1/8″ less than the inside gable height of 13″. Cut the remaining dowels and assemble both racks. To keep things tidy, I didn’t use glue on these joints. A nice tight fit and the addition of a finishing sealer later will hold everything together. Finally, you can assemble your rack. Start by marking a centre line across the width of the bottom piece. Stand the gables upright on the bottom and fasten the curved rails to the top on each side. The faces of the curved rails must be flush with the gable edges. Use two #8 x 1 1/4″ screws to secure each joint. Next, fasten the gables to the bottom piece using three #8 x 1 1/2″ screws driven up from underneath. Be sure the gables are parallel and positioned equally from both ends of the bottom. 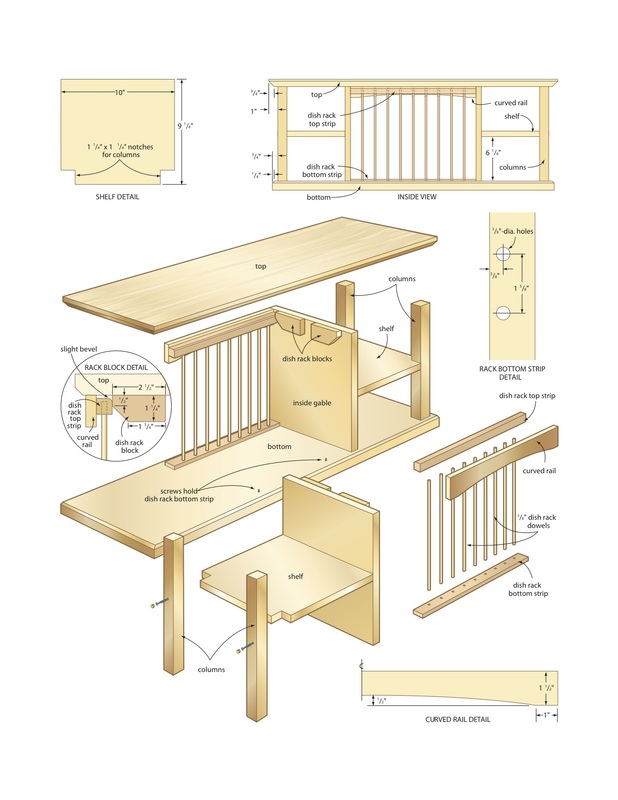 Secure the shelves 6 1/8″ up from the bottom pieces, flush with the gable edges, using three #8 x 1 1/2″ screws. It’s best to use some scrap plywood cut to size to act as a temporary support as you install the columns. Fasten these to the bottom with a single #8 x 1 3/4″ screw per column. The plate racks come next. 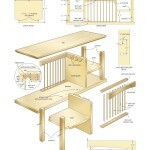 Fit the assemblies between the gables, making sure there’s a 1/16″ gap between the end of each rack strip and the gable. The plans show how the inward facing edges of the top strips need a slight chamfer to allow the dish rack to tilt during removal and re-installation. 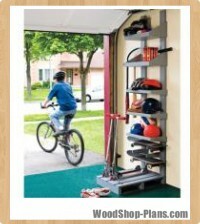 There are two design features that will make the rack easier to use. The first is the two #8 x 1″ brass screws installed underneath each rack. Drill and counterbore holes so these can be tightened into matching holes in the dish rack bottom strips. With screws loosened, the racks can be lifted and tilted out for removal. 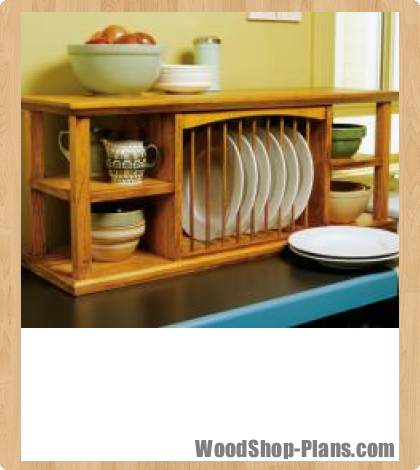 The dish rack blocks are another project feature that needs some explanation. 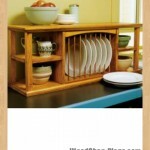 Cut these as shown in the plans, then clamp them in place and try to remove and install the dish racks. Adjust the location of the blocks or plane down the top of the racks until they tilt in and out freely. When everything is fitting well, fasten each block with two #8 x 1/2″ pan-head screws. Complete the assembly process by installing the top using #8 x 1 3/4″ screws-one in each column and three in each gable. Plug all screw holes and complete a final hand-sanding using 150-grit paper. To finish my dish rack, I started with one coat of Minwax Puritan Pine stain, followed by three coats of spray lacquer. An easier alternative for the non- ventilated home workshop is two coats of wipe-on polyurethane, followed by a final, brush-applied coat of semi-gloss urethane.